The gift of time immortalised in Titan Nebula's Palace Collection is not a present, but a legacy. At face value Titan Nebula's newly unveiled Palace Collection doesn't bear much resemblance to its muse Umaid Bhawan Palace, Jodhpur. One of the largest private residences in the world, the home of the royal family of Marwar-Jodhpur is the glittering centrepiece in the heritage-littered crown of the city. The palace doesn't, of course, supersede the time-worn grandeur of Mehrangarh fort but does hold its own gracefully. Titan's Nebula collections, renowned for encapsulating the core of royal Indian opulence, have had a long-running fascination with palaces. The makers of the exquisite Rambagh Palace collection and the Rajputana collection have done it again with a new palace as muse. The Palace Collection could, in fact, have looked very different. The spectacular architecture of Falaknuma Palace, Hyderabad, was the first choice of inspiration but Umaid Bhawan's understated Art Deco chic won through. Watch designer Abhijit Bansod, besotted by the curlicues and the aura of poetry reverberating through the palace, has used enamel and rose gold to reflect the champagne-hued decor. The collection that uses 18-carat gold and precious metals couldn't have had a better source of inspiration. The first numbered pieces of the eloquently titled watches for 'him' and 'her' were gifted to Maharaja Gaj Singh II and Maharani Hemlata Rajye on the occasion of the king's birthday. The pieces are exquisite; so much so that Maharani Hemlata Rajye felt it best to relinquish hers to Vaara, her granddaughter. The little lady, who has a keen eye for beauty and a Penhaligon perfume named after her, was seen showing it off proudly. 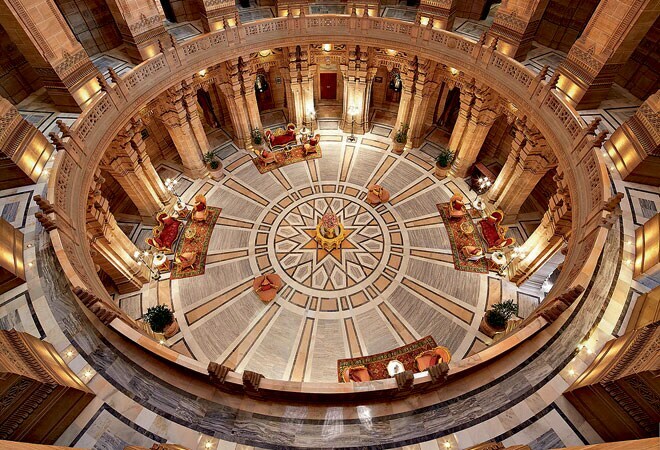 The radial of the grand court, has been replicated in the Maharaja watch. 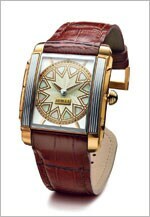 The watches emulate the patterns of the two courts that lead to the open air durbar. The Central Court, a majestic structure replete with royal signia and emblems on pillars, is the inpiration for the Maharaja watch. The gentler silhouette of the Maharani watch resonates with the elegance of the beautifully ovoid Palm Court at Umaid Bhawan. The power of motifs is most evident in the diamond-rippled Maharani watch, inspired by the contours of the smaller but equally artistic palm court. Devoid of floral elements, the staircase makes a shapely climb to a sun-dappled coffered ceiling. Slits illuminate the court, lending depth to the carvings running up the length of the stairs. The looped hands seemingly aflutter on the dial is ensconced in a diamond-studded case. The enamel-embellished links of the bracelet, studded with 136 diamonds, converge in a link clasp. For Bansod, the best designs come from the poignant and captivating retelling of a familiar tale. While capturing the essence of Rajputana heritage in a rose gold bezel, he has encountered many a representation bordering on the profound. He envisioned the Maharaja watch as a bold statement, evocative of the ethos of a ruler. Fitted within a delicately rendered case, the pattern of the central court is replicated in a sapphire crystal dial grooved with overlapping triangles. The mother-of-pearl detailing and a prominent crown lend boldness to the regal pattern offset by a rich leather strap. Complementing its gallant contours is a 25-jewel Swiss automatic movement and a gold buckle. The renditions for him and her have very distinct aesthetics that share an underlying harmony. 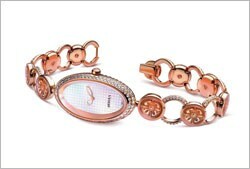 The yin and yang theme pops up in this collection through the metal clasp for her and a luxurious leather band for him. These are perfect as gifts for silver jubilee anniversaries and as wedding presents. The 100 limited edition timepieces, across rose gold and yellow gold variants are available at select Titan outlets.